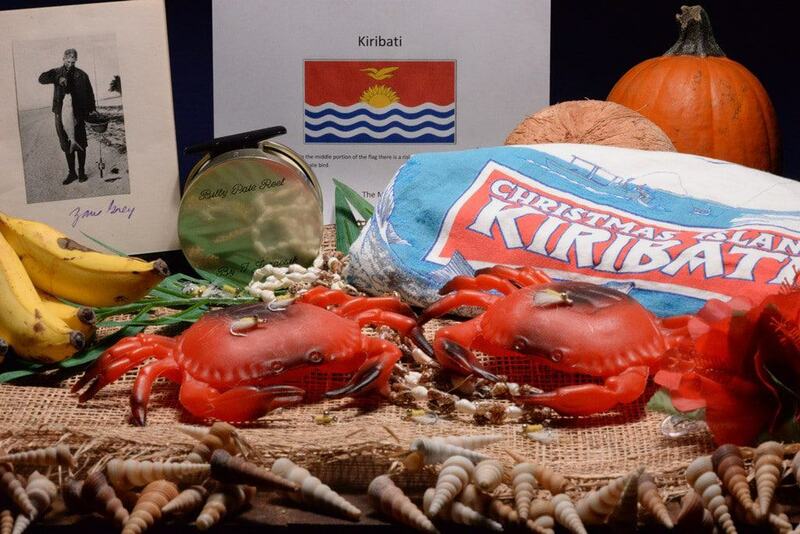 Kiribati is pronounced, Kir-i-bas. Ti is spoken as an “s” and means Gilbert or Tungaru, as many of the islands that make up Kiribati used to be known as the Gilbert or Tungaru Islands. The other island groups are known as the Phoenix Islands and Line Islands. This nation of islands is made up of 32 coral atolls and one solitary island, called Banaba. (An atoll is a ring-shaped, coral reef including a coral rim that encircles a lagoon.) The entire square footage of all the islands combined is only 313 square miles. Yet Kiribati controls about 1,000,000 square miles in the Central Pacific Ocean for fishing and other rights. Of the 33 islands, only 21 are inhabited. The capital of Kiribati is Tarawa, an atoll in the Gilbert Islands. Kiribati is located on the equator and is the only nation on earth that is in all four hemispheres. The largest atoll there and in the world is called Kiritimati, or Christmas Island, which is 235 square miles. The majority of all the atolls are barely above sea level. I distinctly remember seeing a sign when our Air Tungaru flight landed on Christmas Island that said, “Welcome to Christmas Island, Highest elevation five feet.” There is something a little unnerving about that. There was only one flight, in or out of Christmas Island per week, so our journey would last seven days, no matter what. When I met my husband Dan, his number one hobby was fishing. Christmas Island is known to be one of the premier bonefish destinations in the world. Bonefish are also known as the “grey ghosts.” There is no affiliation to our beloved author Zane Grey, although he has written some wonderful tales about them. One rare, Zane Grey pamphlet worth collecting, is called, “The Bonefish Brigade”, which was sent to his friends as a Christmas gift. Zane Grey did have an affiliation with Christmas Island. His yacht, “The Fisherman” was sold to a Frenchman who owned several coconut groves there. Father Rogier converted “the Fisherman” to a freighter and used it to transport copra (dried coconut meat). The name was changed back to “Marshal Fuch”, the original name of the boat. Copra remains a very important revenue source for Kiribati. 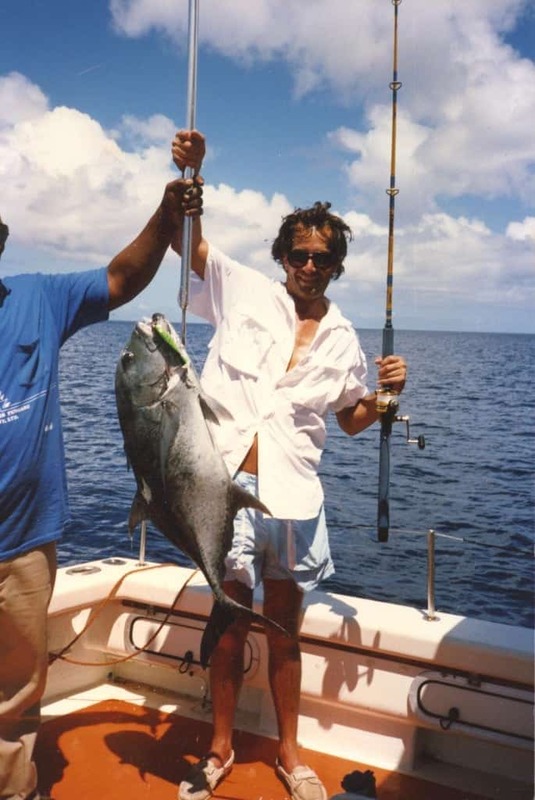 Before we ventured to Christmas Island, I had to learn how to fly fish. That was how we would fish for the elusive bonefish. Needless to say, Dan made sure I was outfitted to the hilt. For you fishing enthusiasts, I had the first, Sage three fly rod ever built, along with a beautiful, Billy Pate fly reel. I was taught to fly fish by two of the best in the world; Lefty Krey and Mel Kreiger. I also learned how to tie flies, as we needed to bring a gross of Crazy Charlies with us (that is the name of the fly, used to catch them.) I tied all 144 of them myself. When we arrived on the island, our home would be the Captain Cook Hotel. The accommodations consisted of thatched roof bungalows right on the beach. I wondered why there were brooms placed all over, and it became clear, rather quickly. Christmas Island is home to the red, land crab. They are pretty good sized and all over the place. The brooms were there to shoo them out from under the bed or out of the shower. I remember one night when we were returning to the room for the evening, one was sprawled right across the handle of the door to the bungalow, and nearly gave us a heart attack. 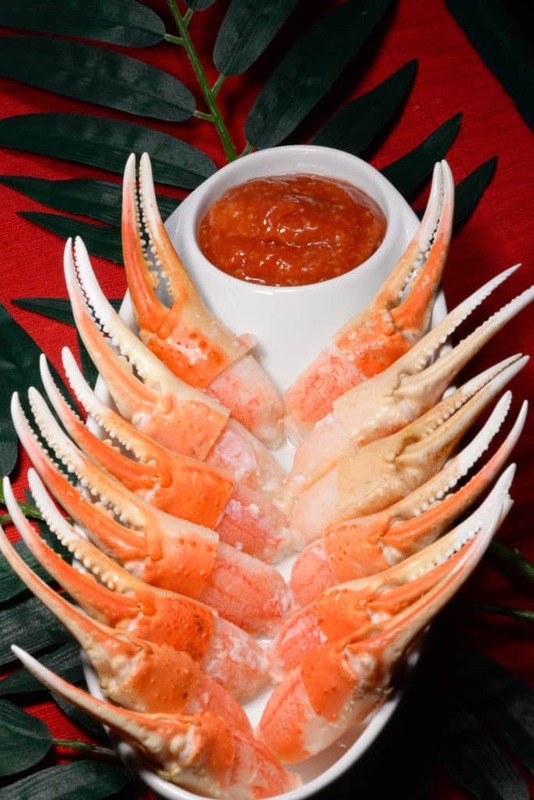 They were on the appetizer menu every evening and I can attest that they are mighty tasty. I always felt terrible when the guide would drive us to our fishing destination and kill so many of those creatures as we drove along. They just could not be avoided. It is estimated that 40-50 million of these bright red, land crabs live in shady sites all over the island. It was also the time of the annual migration of these creatures. Today they are protected and several crossings and road closures are now in place during the migration. Words cannot begin to express how beautiful a coral atoll is in the middle of the Pacific. It is the water that takes your breath away. 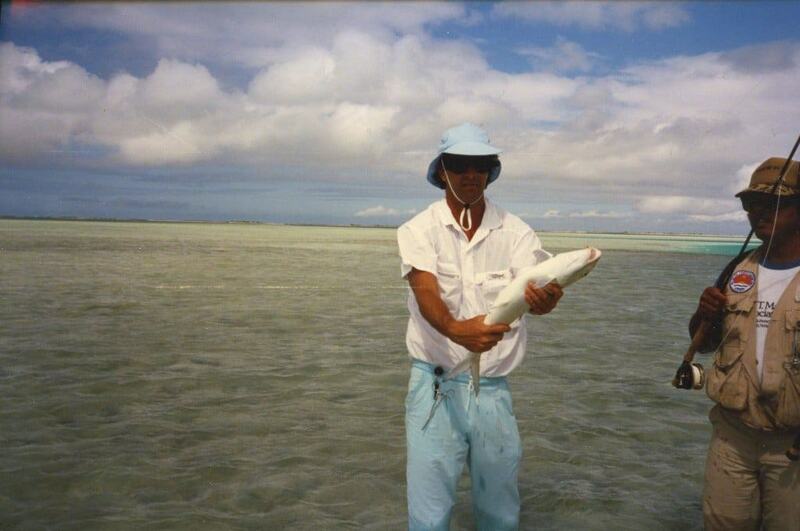 We would fish on the flats, in crystal clear water, a little less than knee high. Just off the flats, you would be in deep water. The colors of the water would change based on the depth, from azure blue to aquamarine. It is simply stunning! Let’s just say, in these parts, high and low tides are very important events with which to concern yourself. Some days we would drive to a location but had to return by making our way across a giant pipe, carrying our belongings above our heads to avoid getting them wet as the tide rose. Where you could walk on land in the morning was completely under water by the afternoon. On this particular day, we were out fishing the flats with our two guides and nature called, (I had to use the restroom, which was nonexistent.) My husband suggested that I just go off the flat into the deep water. That day I was wearing some brightly colored, flowered pants. When I jumped off the flat, I got instantly circled by about six or seven black tip, reef sharks that must have thought I was a rare, new species. Needless to say, I freaked, yet somehow I managed to get myself back up on the flat. My urge to use the restroom had strangely vanished. Nothing happened to me, other than my nerves were a bit rattled and after that, even the tiny, foot long sharks that were all over the flats, began to startle me. A couple hours later, my urge to use the restroom returned. I espied an island about a quarter mile away and decided I would go there and find a tree or bush. I don’t know if you have ever seen the movie “The Birds” by Alfred Hitchcock? As I approached the island, birds starting dive bombing me and hovering inches from my face. I had to use my fly rod to defend myself and all I heard from a quarter mile away was “Don’t use the fly rod.” I guess the fly rod was more valuable than I thought. It turns out this little island was a nesting colony for sooty terns and they were simply protecting their nests. Thankfully, I didn’t die by birds! It is no coincidence that Christmas Island is also a great destination for bird watchers. Next, we were on our way to fish for giant trevally. On our way there, we were trolling and something very large latched on to our lure down and darted straight out. (This was on a Penn International, 50 wide reel, with about 850 yards of 80lb test line.) Despite the captain backing down the boat as fast as he could, the fish, which we assume was a giant tuna, managed to spool the entire reel and when it got to the end, it sounded like a magnum pistol went off as it snapped the line. We will always wonder how big that fish was. Suffice it to say, we had never experienced anything like it. Our destination for trevally fishing was near the shoreline and dotted with huge, underwater rocks. This is home to the giant trevally and by far the most fun fishing we had. You would throw the line out as far as you could, (it was a pencil popper on a spinning outfit, with light line) and you could see the huge fish come out from the rocks in the crystal clear water and slam that lure. We blew out the drag on every spinner we had, and ended up hand lining like the locals do. 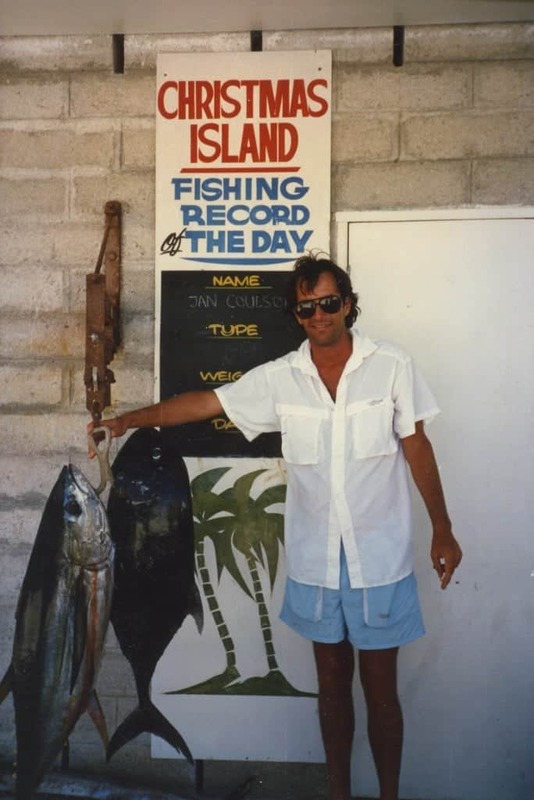 This was a day of fishing we will never forget and why Kiribati’s Christmas Island is one of the best fishing destinations in the world. Speaking of trevally, I actually caught a world record while I was there and didn’t even know it. I caught a small, blue trevally on a fly, which happened to be an open class in the record books for women. Several islands in northern and central Kiribati, were occupied by the Japanese in World War II. The Battle of Tarawa was one of the bloodiest battles of that war. Today, several war relics remain on the islands and in the sea where tourists can view them first hand. The famed author, Robert Louis Stevenson, spent two months on the Abemama Atoll back in 1889. 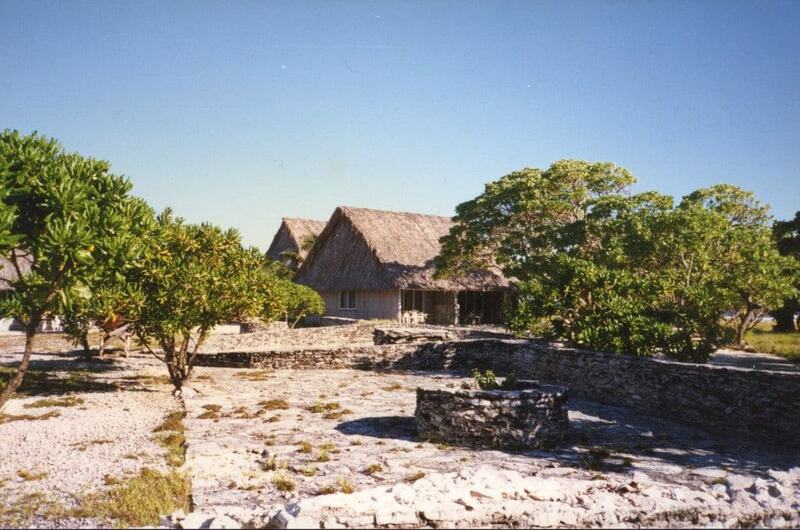 This is where the tyrant, Chief Binoka, resided and was immortalized by Stevenson is his book, “In the South Seas”. Today Chief Binoka’s gravesite is a tourist attraction. As one may imagine, not much grows on coral atolls. They only have about 2% arable land. Coconuts and pandanus trees are native, along with pumpkins, taro, breadfruit, banana, papaya and mango. Worms in the soil prevent much else from growing. The locals have a few raised bed gardens to grow their greens but water is also a precious commodity. Evidently the worms dry out and die before they can reach the plants in the raised beds. Most of the food supply is brought in by plane or ship. 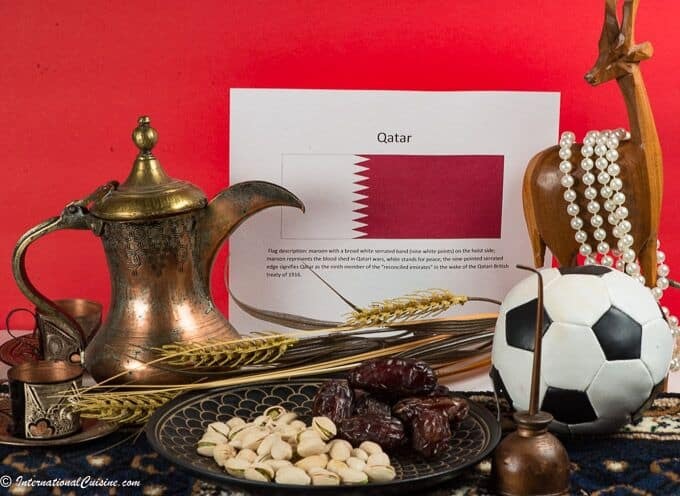 Their main source of revenue comes from copra, seaweed, tourism and fishing industries. 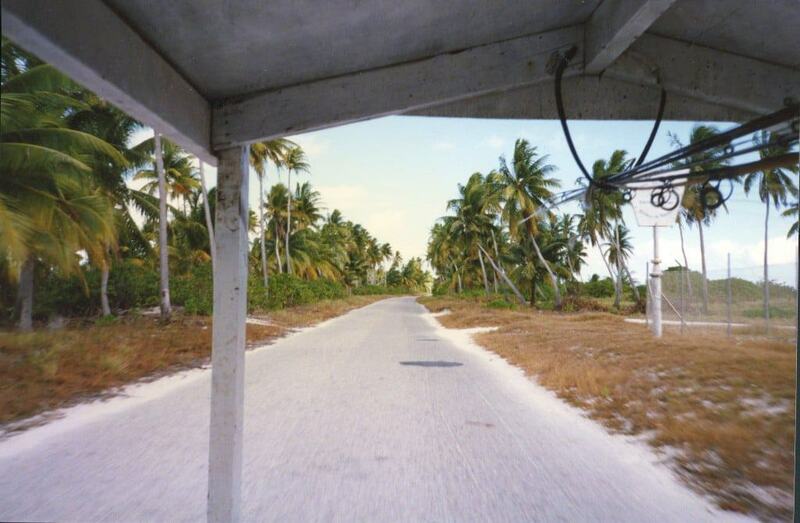 As we look into the cuisine of Kiribati, fish, shellfish and coconuts are central to the diet. The coconut produces a flower spathe from which (the sap) is made into a toddy. It is rich in vitamins and can also be soured into vinegar or fermented into an alcohol. Taro and pumpkin are regularly consumed and rice, considered a staple food, as well as canned meats and condiments are all actually imported. Some natives raise chickens and pigs to get their meat to cook with on festive occasions. On our final night on Christmas Island, we enjoyed a Micronesian feast of roast pork (the whole pig was cooked in an underground pit) poi and rice was served and accompanied with native music and dancing. The natives came in their authentic dress of bark cloth sarongs, decorated with an amazing assortment of shells and put on a wonderful show for us. We found the natives to be very kind, warm and welcoming. 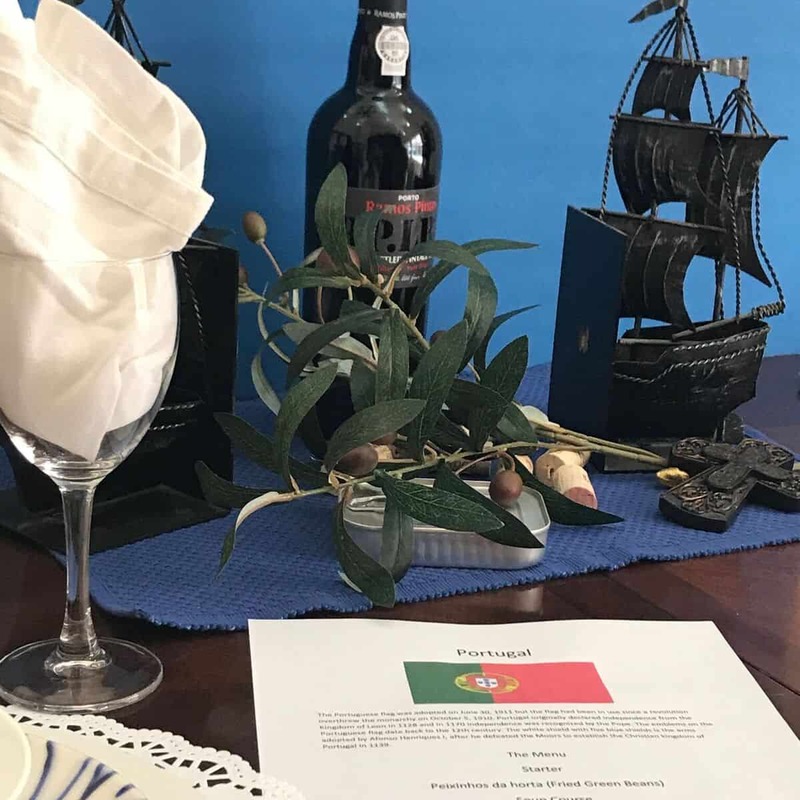 We decorated our table with several souvenirs from our trip to Christmas Island. A sarong was used as our centerpiece with sea shells to adorn it. Palm fronds, coconut and bananas rounded out the setting. Our second course was a pumpkin and coconut cream soup. 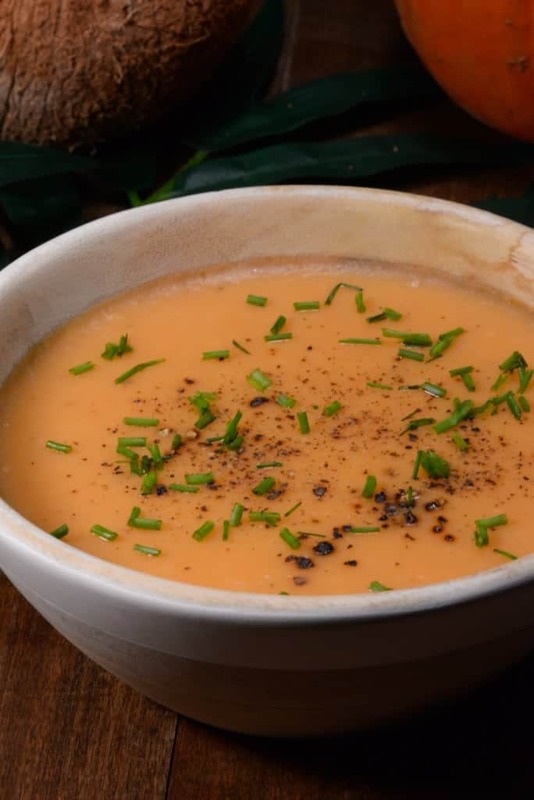 This sweet and savory soup can be enjoyed either hot or cold. Both pumpkins and coconuts grow plentifully on the islands there. For the main course, we presented a glazed mahi mahi. 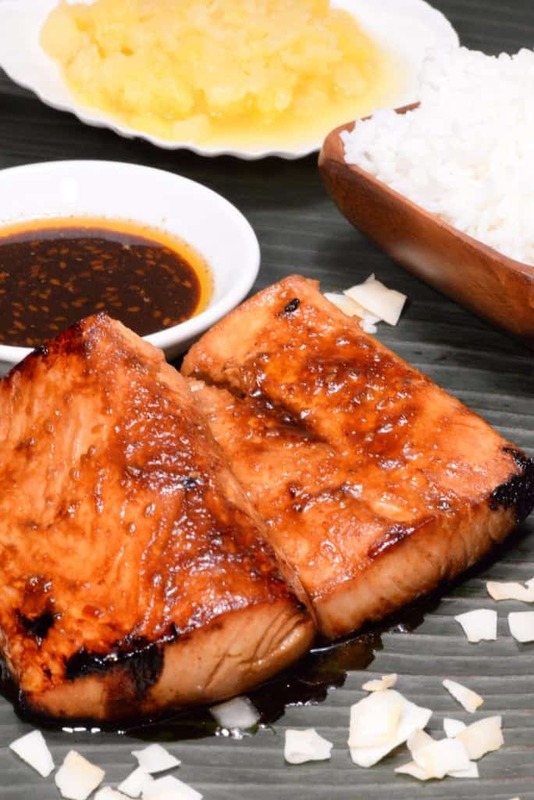 The glaze was made of teriyaki, sugar, ginger and sesame seeds. The thick glaze was delicious on this perfectly cooked, flaky mahi mahi. This glaze would be wonderful on nearly any kind of fish or even chicken, simply scrumptious. Mahi mahi is common in the region, although it is sometimes called Dorado, in other parts of the world, or the dolphin fish (but it has no relation to “Flipper”.) The fish was served with plain white rice and crushed pineapple. Delicious. For dessert, Samoan poi was served. 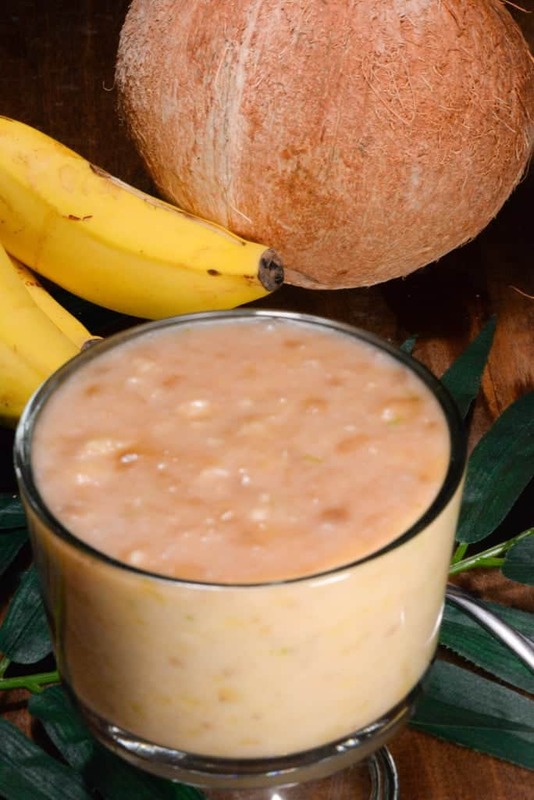 It is basically mashed bananas with coconut cream that somewhat resembles a smoothie. Samoan poi is a perfect dessert to enjoy on a tropical coral atoll or anywhere for that matter, but is particularly refreshing on a hot day. As we say goodbye to Kiribati, it is important to note that this will be the first country to be completely destroyed by climate change. It is estimated it will be totally submerged, due to the rising sea level, by the end of this century. The government has purchased land in Tahiti and has asked for assistance from New Zealand and Australia to help with the inevitable migration. I feel blessed to have visited this beautiful country and if you like fishing or just want an adventure, it is guaranteed to be a trip of a lifetime. As we departed the island, we noticed that ice chest after ice chest was labeled for the fish market in Hawaii. It turns out all that fish we caught on the blue water boat was headed there. After giving it some thought, it made sense that they would rather have cash to buy something they need rather than consume the fish that is readily abundant to them. We were happy for them. PS I really am curious if you had ever heard of this country called Kiribati before? Please let me know in the comments section below and thanks for being part of the journey! Wonderful presentation on the food shots, as well Thank you for sharing! Thanks Adam, it was truly a unique experience to visit Christmas Island. It is sad to know that one day it will be underwater. I am so happy you enjoyed it! Wow. What a wonderful time. Who is the guy in blue shorts? And, Zane Grey too. I wonder if ZG stopped there on one of his trips to Australia? Yes Henry our trip to Christmas Island was a while ago. Zane Grey must have been through there, for sure on his 1932 trip. We know he stopped in Tonga and Fiji. We couldn’t find any reference to him actually visiting there. Thanks so much for your comments and being part of the journey! I am an American living in Vanuatu, which, like Kiribati is also in the South Pacific. I have made acquaintances with several people from Kiribati. I am learning to cook and eat many of the great foods here, and the foods are similar to Kiribati. If you travel here, make sure you come when the breadfruit is in season, as the mamas here have a great recipe and go to much work to make it. Hope you come. I live on Santos Island the largest island in Vanuatu. Thanks Karen, What a wonderful place to live and learn to cook! I’m totally jealous. I would love to visit when breadfruit is in season, when is that? I would also love any Vanuatu recipes you can share. It was very difficult finding any recipes for Kiribati so it helped a lot that I was there. Thanks so much for your comments and being part of the journey! I look at your photos, and even though I might already be full, I am starving after I look at your photos, and read your stories. Thank you! What an absolute pleasure it was to meet you last weekend. I am so happy to have you as part of the International Cuisine Journey and family! Thank you so much for the kind words, it means the world! Well, just wanted to stay in touch. Come hiking again! It is so great to hear from you. I think of the Green Valley Spa and and especially you and the other hiking guides, often. There is just something so spiritual about the place you get to work everyday. Those red rocks in Southern Utah are simply spectacular. I hope to make it back hiking again soon. I remembered that you told me about your hula expertise, I think that is excellent. I always thought it would be fun to incorporate authentic dance into the journey. Thanks for staying in touch! No I have never heard of Kiribati, thank you for your wonderful story and recipes. Thanks so much for your comment, I am so happy you are part of the Journey! I would love to hear if you decide to give one a try, what you make, and how it turns out.